NOTE: These steps will only work if you have a public IP address from your ISP. You can find out if you have a public IP by logging in to expressvpnrouter.com. Once you’ve logged in, go to Status and look at the address. If the address does not begin with “192.168…”, then this is your public IP. 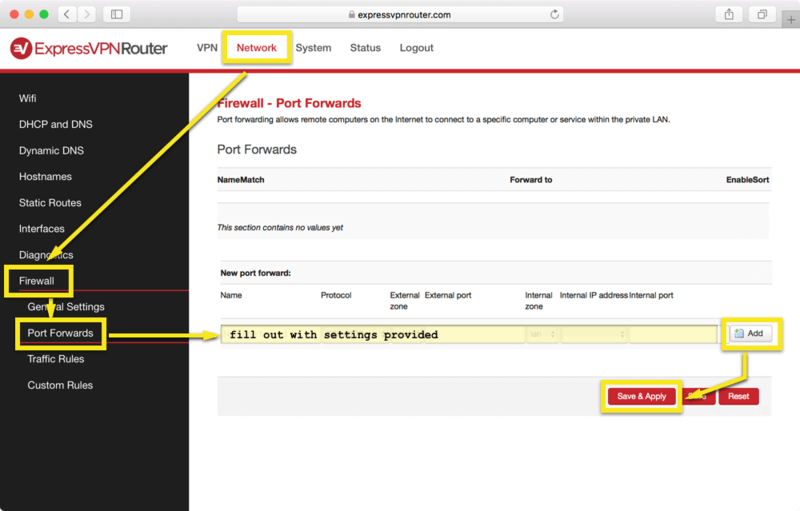 Step 1: Log in to expressvpnrouter.com. Step 2: Select Network in the top navigation bar, then select Firewall > Port Forwards. Click Add > Save & Apply. Select Administration from the top navigation. In the Management screen, under “Remote Access”, enable Web GUI Management. Step 2: Click Apply Settings. You can also use port forwarding to access devices and servers connected to your local network. 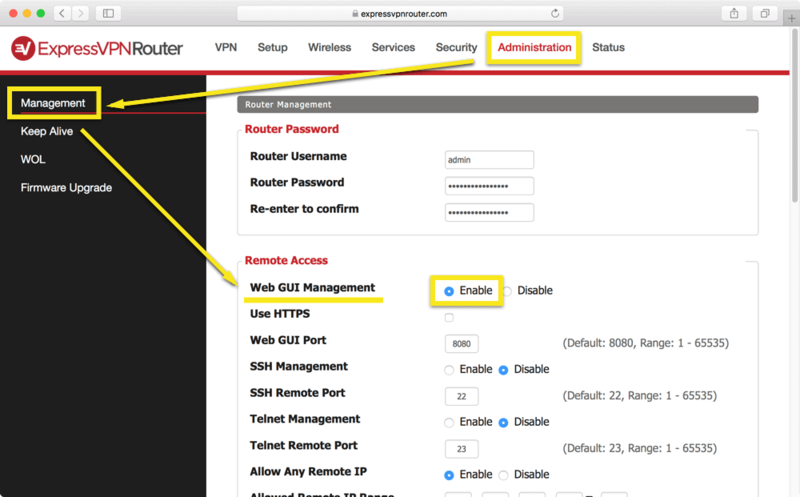 Make sure the device you want to remotely access is connected to your ExpressVPN router. Visit www.expressvpnrouter.com and go to VPN Options. Select Let me select which devices should be protected. Scroll down to Recently Connected Devices and toggle protection OFF for the device you want to access. Perform the remote access steps in the above sections, according to your router model. When inputting port forwarding values, use values specific to your device or server.